SEOUL -- Euisun Chung, heir apparent to the Hyundai Motor empire, advanced another step toward taking the reins after being promoted to Group Executive Vice Chairman. The appointment comes as Hyundai battles tumbling profits, mounting pressure from activist shareholders to improve its governance, and amid South Korea's trade tensions with the United States that threaten to disrupt its production plans. Euisun Chung has attended government meetings with business leaders in recent years, replacing his father who now makes few public appearances. 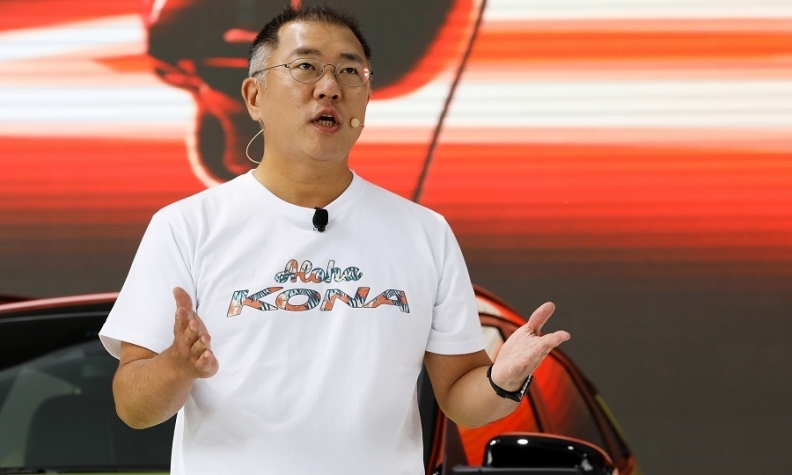 Chung senior, the all-powerful boss, has presided over Hyundai for about two decades, transforming the company into the world's fifth-biggest automaker along with affiliate Kia Motors. The junior Chung has led the group's efforts to develop future vehicles such as autonomous and connected cars, as well as Hyundai's fledgling premium brand Genesis. "Hyundai Motor will actively try to transform itself from a car manufacturer to a provider of smart mobility solutions," Euisun Chung said in a speech at a forum in India last week. A major challenge for him will be how to consolidate his holdings in the group. Hyundai Motor Group in May shelved an ownership restructuring plan that would have tightened the family's grip and paved the way for a succession. The plan had been opposed by U.S. activist hedge fund Elliott Management. "This is a good sign," Park Yoo-kyung, a director at Dutch pension fund APG Asset Management, said of the appointment. "This will enhance transparency about who is controlling the group and who is making key strategic decisions," she said.